Joseph Gaskins has been appointed the new CEO and president of United Spinal Association. United Spinal Association today announced Joseph Gaskins, an experienced Washington, D.C. lobbyist, accomplished executive in the wireless industry and wheelchair user from Seattle, Wash., as its permanent president and CEO. Gaskins took over last December as United Spinal’s interim CEO after the resignation of Paul J. Tobin. He has been a member of United Spinal’s board of directors since April 2013. “Joe Gaskins has the commitment and desire to advance the cause of United Spinal Association — enhancing the lives of people with disabilities. His business acumen, and organizational and leadership skills ensure our future successes,” said Jim Weisman, United Spinal’s senior vice president and general counsel. Gaskins will continue to work closely with United Spinal’s board and staff as he draws on his vast knowledge of accessibility issues to expand and revitalize the organization’s programs and services. “We have accomplished a great deal in the past six months to strengthen United Spinal Association and prepare the organization for a successful and rewarding future,” said Gaskins. “I’m looking forward to what we can accomplish on behalf of our members and the larger disability community in the years to come,” he added. Gaskins has devised creative solutions to obstacles in both his personal and professional lives. Since being spinal cord injured in a hit-and-run accident 27 years ago, Gaskins has worked in the wireless industry as a lobbyist and an entrepreneur. As a triathlete, he has utilized adaptive sports to manage living with a disability, as well as to serve as a motivational outlet while he pursued his career goals. 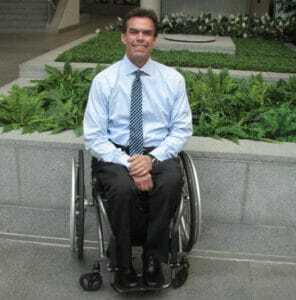 He also has traveled extensively and has a vast knowledge of accessibility issues in countries around the world. Gaskins’ prior positions include vice president of carrier solutions at Grid Net where he established partner relationships and business development at Clearwire. Gaskins said he looks forward to using his skills and experience toward improving disability rights and helping other wheelchair users achieve greater independence.